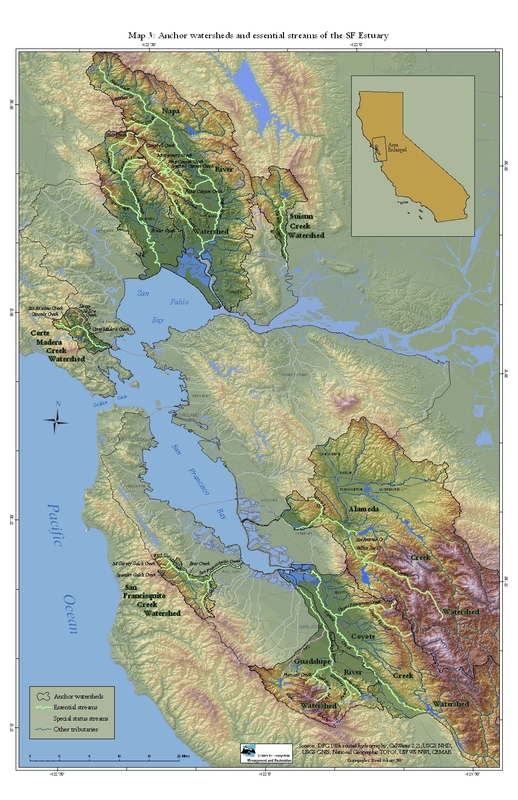 This Report confirms many of the findings of Stanford's 1996 assessment of the Corte Madera floodplain (see below), and expands upon previous surveys in the upper watershed. With dozens of high-quality photographs of riparian habitat areas in the upper watershed, this report focuses on o.mykiss habitat available in tributaries upstream of Stanford's Searsville Dam. The overwhelming conclusion of years of field surveys, study, observations, and photo documentation is that steelhead would recover miles of quality stream habitat in the upper watershed if Searsville Dam is removed. Cover image from report: Searsville Dam with water spilling. The study area for this summary of existing information includes those areas most likely to be affected by the potential future actions being considered by Stanford for Searsville Dam and reservoir, which are assumed to include Searsville Reservoir, marshes and wetlands upstream of Searsville Reservoir (to upstream limit of areas of sediment deposition or directly influenced by Searsville Reservoir and Dam), and Corte Madera and SF creeks downstream from Searsville Dam to San Francisco Bay. Due to high residence time of water in the reservoir, associated decreases in water quality and increases in temperature, and the presumed abundance of predatory, nonnative fishes, Searsville Reservoir may not be a very hospitable environment for native fishes. Native fishes may colonize the reservoir from upstream, but the reservoir itself may be a sink for most native fishes, where predation is heavy, thermal stress common, and reproduction low or nonexistent. Steelhead and rainbow trout are the same species and the term steelhead may refer to resident rainbow trout that co-occur with steelhead. SF Creek below Searsville Dam (including tributaries Bear Creek and Los Trancos Creek) is included in Santa Clara Hydrologic Unit 2205 of designated critical habitat for CCC steelhead (50 CFR 52488-52627). SF Creek supports one of the few remaining steelhead runs in tributary streams to San Francisco Bay. Figure 6.2 [reproduced at right] illustrates the number of steelhead per mile collected from various reaches of Corte Madera Creek downstream of Searsville Dam, SF Creek and Los Trancos Creek between 1997 and 2006. The main limiting factors for steelhead production in the SF Creek watershed are availability of winter refuge (from high flows) habitat, high summer water temperatures, and impediments to passage. Steelhead are known to spawn within the SF Creek watershed including some portions downstream of Searsville Dam that flow through Stanford University property (Stanford University 2012). 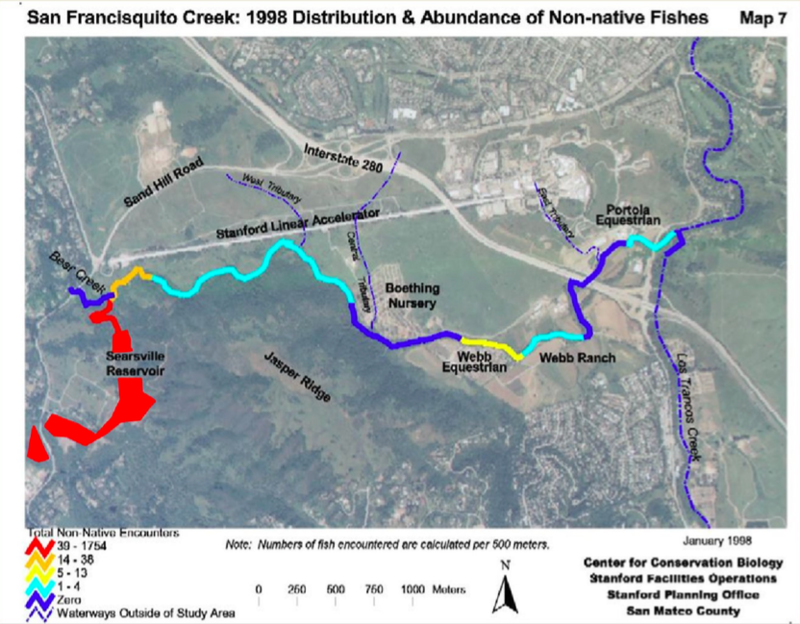 San Francisquito Creek Watershed is among a handful of Anchor Watersheds for steelhead recovery. Full map available at cemar.org. Eight of our region’s watersheds account for about 75 percent (i.e., 175 stream miles) of the regional habitat resources, and we call these “anchor watersheds” to reflect their importance. Searsville Reservoir is the primary source of non-native species in the San Francisquito watershed. Invasive species thrive in the unnatural, temporary habitat areas in the reservoir behind Searsville Dam. Some of these species prey upon and compete with vulnerable native species like wild steelhead. In the area that is now the highly modified reservoir and floodplain of the Searsville Lake/Family Farm Road study area, original native species likely included steelhead/rainbow trout (Oncorhynchus mykiss) [...] and coho salmon (Oncorhynchus kisutch). In recent years, however, the only native species that have been observed with any regularity in the study area are Sacramento sucker and rainbow trout. The presence of rainbow trout/steelhead in the study area or downstream from the study area definitely impacts landuse decisions. The presence of non-native species of centrarchid fishes (sunfish, blackbass, and crappie) is also an important consideration for conservation planning. These fishes are detrimental to virtually all native aquatic organisms and any landuse decisions should be evaluated in terms of their impact on non-native fishes. Several of these species, most notably largemouth bass and brown bullhead, are significant predators on other fishes (and anything else they can swallow) and are impacting the biotic communities present in the area -- undoubtedly to the extent that bass are a major factor in structuring the aquatic community present in Searsville Lake. The UC Davis Center for Watershed Sciences & U.S. Geological Survey (USGS) identifies Searsville Dam as one of California's "problem" dams "in most need of attention to protect fish, particularly native species." Despite California Department of Fish and Wildlife Code 5937, which requires dam operators to release enough water downstream to keep fish in good health, Stanford does not have flow release measures at Searsville Dam to protect threatened steelhead and other sensitive species downstream. This study offers a systematic framework for identifying dams that likely need improved downstream fish flows as required under Section 5937. From an original pool of more than 1,400 dams, 220 are identified as high-priority candidates for further investigation of environmental flow needs for fish. These dams fall within a broad range of biogeographic settings and represent a wide diversity in size, function and ownership. Full PDF journal article available here. 100 years of California’s water rights system: patterns, trends and uncertainty, Environmental Resource Letters (2014). The state has allocated a total maximum allowable use of 370 million acre-feet of surface water -- more than five times the 70 million acre-feet available in a year of good precipitation, according to the researchers' review of active water rights on record. 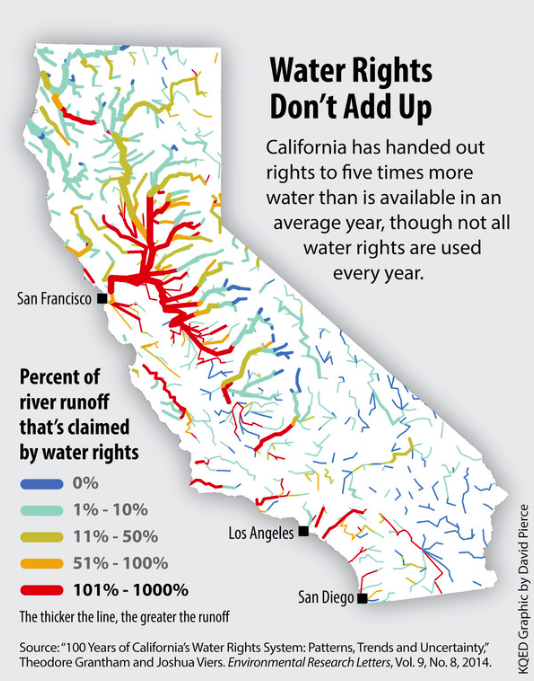 Related news coverage: California’s flawed water system can’t track usage. Associated Press, May 27, 2014. Salmon and other native freshwater fish in California will likely become extinct within the next century due to climate change if current trends continue, ceding their habitats to non-native fish, predicts a study by scientists from the Center for Watershed Sciences at the University of California, Davis. The study assessed how vulnerable each freshwater species in California is to climate change and estimated the likelihood that those species would become extinct in 100 years. California's native populations of Pacific Coast salmon and trout appear to be rapidly headed toward extinction. Eighty-one percent of anadromous taxa are threatened with extinction and 73% inland taxa are either threatened or already extinct. [M]ajor causes of decline are related to increasing competition with humans for water, human degradation of watersheds, and adverse effects of hatchery propagation. Climate change, interacting with the other causes of decline, is increasing the trajectory towards extinction for most populations. Several recent studies have found that dams and reservoirs are a major source of methane emissions worldwide. New research shows that reservoirs in temperate areas can emit as much as tropical reservoirs, and that sediments trapped behind reservoirs are a significant factor. Stanford's sediment-choked Searsville Reservoir is particularly susceptible to elevated methane emissions due to high erosion rates upstream and nutrient input from adjacent horse facilities and upstream agricultural lands leased from Stanford. Schematic methane emission pathways from a hydroelectric reservoir. Multiple methane emission pathways from a reservoir and dam. January 2015: Stanford faculty call on Stanford University to protect the future of the climate. November 2014, United Nations, Intergovernmental Panel on Climate Change: 5th Assessment Report. The most recent UN Climate Change Report identifies the habitat impact from dams and reservoirs as an environmental concern in need of climate change mitigation actions. The report states with "high confidence" that species extinctions will be driven by several climate-associated drivers including reduced river flows and interaction with eutrophication and invasive species. Stanford University's operations at Searsville Dam currently results in reducing and/or eliminating downstream flows. The reservoir enables ongoing eutrophication and proliferation of invasive species that spread downstream. Globally, reservoirs could emit up to 104 teragrams of methane per year. By comparison, NASA estimates that global methane emissions associated with burning fossil fuels totals between 80 and 120 teragrams annually. Inland waters transport and transform substantial amounts of carbon and account for ∼18% of global methane emissions. There are millions of small dams worldwide that receive and trap high loads of organic carbon and can therefore potentially emit significant amounts of methane to the atmosphere. This report evaluated the effect of damming on methane emissions in a central European impounded river. The reservoir reaches are the major source of methane emissions and emission rates far exceed previous estimates for temperate reservoirs. Our results suggest that sedimentation-driven methane emissions from dammed river hot spot sites can potentially increase global freshwater emissions by up to 7%. Researchers have documented an underappreciated suite of players in global warming: dams, the water reservoirs behind them, and surges of greenhouse gases as water levels go up and down. In separate studies, methane levels jumped 20- and 36-fold during drawdowns. This historical fisheries report from Stanford University's first president documents trout species native to Stanford campus, and features excellent illustrations of fish including the steelhead illustrations to the right and a Rainbow trout: sea-run specimen from San Francisquito Creek below. In 1898, David Starr Jordan said: Our treatment of animals will someday be considered barbarous. There cannot be perfect civilisation until man realises that the rights of every living creature are as sacred as his own. Detail from Map in Notes on the Fishes of the streams flowing into San Francisco Bay, California (1906), at page 337.